In a normally operating cell, the cell cycle typically goes through several phases of growth and reproduction, and if everything goes “according to plan”, it will live its life until it undergoes a “programmed cell death”, known as apoptosis. However, when a normal cell becomes cancerous, it is because there is an accumulation of mutations in critical portions of the DNA that are vital for normal cell functioning. There are many parts of the DNA molecule that are vital for normal cell functioning, including proto-oncogenes and tumor suppressor genes. These two genes play a particularly important role when diagnosing cancer. Proto-oncogenes are genes that code for transcription factors, which stimulate the expression of other genes that control different aspects of the cell cycle. 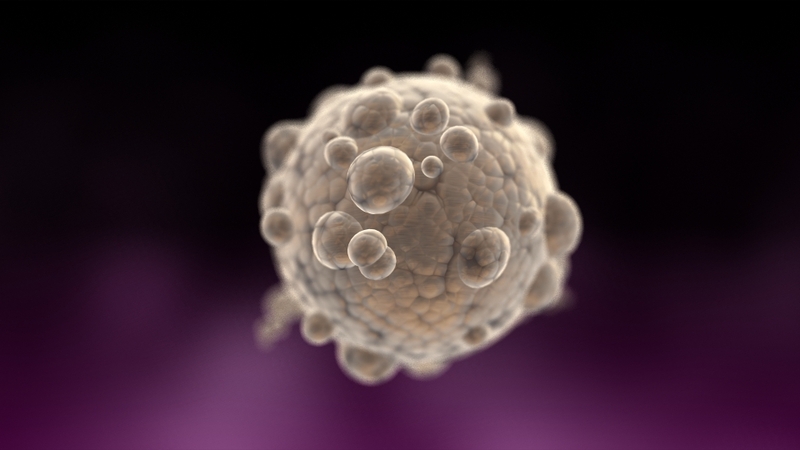 The proto-oncogenes are turned on and off, depending on the cell’s needs. 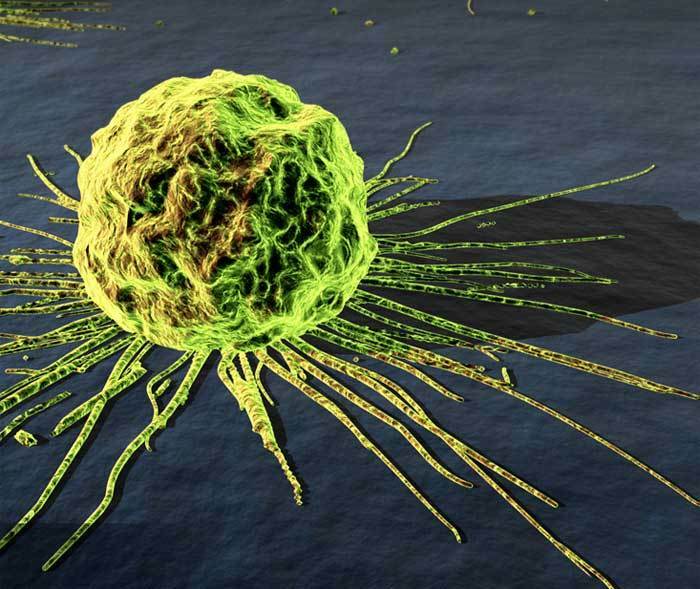 In cancerous cells, proto-oncogenes are mutated into oncogenes (cancer-causing genes), resulting in constant expression of the gene that was previously only turned on when needed. This signals to the cell to constantly divide by giving it a constant “green light”, resulting in uncontrollable division. Tumor suppressor genes are genes that “keep an eye on” the cell cycle, and initiate the process of apoptosis when needed. In a normal cell, proteins coded for by the tumor suppressor genes will inspect the cell cycle at certain checkpoints, making sure everything is in working order. If the cell needs to die, a properly functioning tumor suppressor gene will initiate the process. However, when the cell becomes cancerous, the tumor suppressor gene is turned off, and apoptosis is not induced at the appropriate times during the cell cycle. 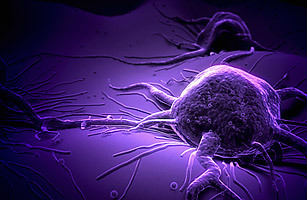 There is uncontrolled cell growth in the cancerous cells and, as the name suggests, tumors are no longer suppressed. Generally speaking, cancer is caused by an accumulation of genetic mutations in certain portions of the DNA (as discussed above). However, there are a variety of ways that an individual could accumulate these cancerous mutations: genetic predispositions, sun (UV light) exposure and carcinogens. If someone has a genetic predisposition to cancer, this does not mean that they will definitely get cancer, because ultimately the mutations are random. However, this does mean that there is a higher likelihood that that individual will get cancer. The reason they are more likely to get cancer is because they may already have a mutated copy of a vital gene (allele), given to them by one of their parents. People without a genetic predisposition do not have an allele of the cancerous gene, and are therefore less likely to get cancer. However, both people are susceptible to cancer. Over exposure to UV radiation is another way that someone may get cancer. The UV radiation has the ability to penetrate the cell in a way that other forms of light cannot, causing mutations in the DNA. In some instances, the UV radiation causes two nucleotides (thymines) to connect with each other (instead of the corresponding adenines), creating a “thymine-dimer”, which is one of the primary causes of skin cancer. Carcinogens are another hazardous way that someone may get cancer. Like the UV light, carcinogens directly cause mutations in the DNA by interacting with it on the molecular level. Relatively common carcinogens include cigarette smoke, asbestos, engine exhaust, and viruses such as human papilloma virus. In general, cancer is a relatively un-curable disease. It is treatable at the moment, but because cancer is a fundamental change at the DNA level, cancer only ever goes into remission. There may be some advancement in cancer research in the future, but for the time being, all we can do is understand what causes cancer and how we can prevent exposure to these things.